In mechanical engineering System of limits or Limit System is a concept of controlling the sizes of machine elements while manufacturing of each component. Because taking exact dimensions is an ideal condition but in practical(Manufacturing/Measuring) methods, it is not possible. So limit system enables how much amount of deviation is acceptable. How do we apply the limit system in the design of the machine elements? When one part is matting with another one, first of all, the fit between the two parts must be determined. [Learn more about Types of Fits]. To determine the fit, we must take one component as the constant member and the second component will have the deviations according to the type of fit chosen. By making a constant member we can classify them as hole basis system and shaft basis system. these are the two bases of the limit system. 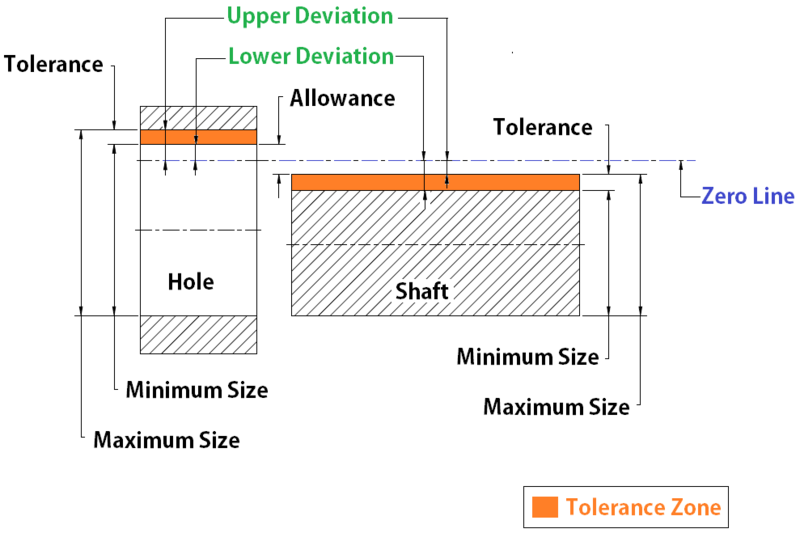 In hole basis system Hole values are constant and the deviations will be considered in the shaft dimensions. In Shaft basis system the shaft dimensions are constant and the deviation will be considered in the hole dimensions. Let’s back to the subject, so what are the important nomenclature used in the limit system? These are the important terms used in the limit system. Let’s see what are the definitions of all above-listed terms in the Limit System? Before going getting to know about the definitions we need to understand the following schematic diagram which will help us to understand the definitions in a more clever manner. The term shaft is meant for any external dimension of the part whereas the hole represents for the internal dimension of the part. The exact size of the component which is mentioned in the drawing for the ideal condition. ( For the convenience purpose only). This basic size an nominal size often same. This basic size is the dimensions where we apply tolerances. Example: 30.000±0.015 where the 30.00 is the basic size. This is the actual dimension of the part taken by a measuring instrument. This actual dimension should not exceed the tolerance limits mentioned to the basic size. The extream possible deviation is called as the limit of the size. there are two extream possible limits of sizes. they are the maximum limit(Upper Limit), The Minimum Limit(Lower limit). The difference between the basic size of the hole and shaft is known as the allowance(From the above figure we can define it as the difference between the lower limit of the hole and Upper limit of the shaft ). It is positive when the shaft size is smaller than the hole size. It is negative when the shaft size is larger than the hole size. 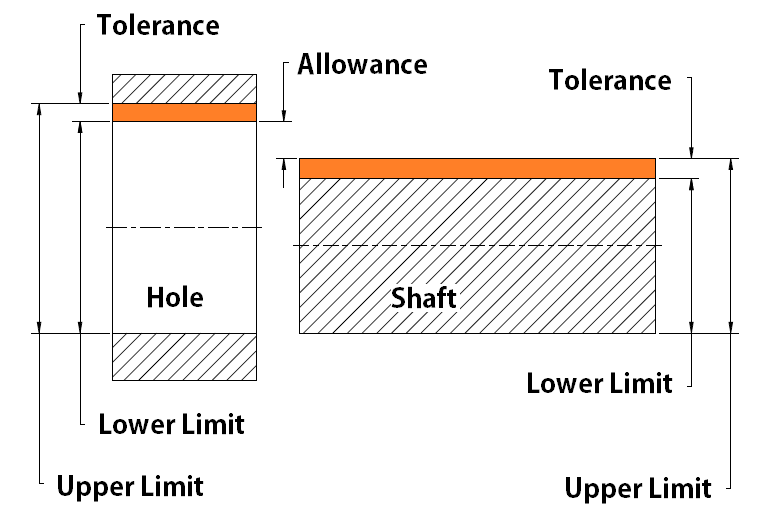 The difference between the Upper limit and the lower limit of a hole or a shaft is known as the Tolerance. We can also be said as the maximum permissible deviation with the basic size is known as the Tolerance. Tolerance can be a unilateral system of tolerance or bilateral system of tolerance. The zone between the Upper limit and the lower limit is known as the tolerance zone. The imaginary straight line corresponding to the basic size of the shaft or hole, which is used to measure the deviations. The difference between the basic size and the Maximum size is known as the upper deviation. The difference between the basic size and the Minimum size is known as the Lower deviation. The difference between the basic size and the actual size of the part after manufactured. (Measured with an instrument) is known as the actual deviation. The fundamental deviation is the form of allowance. In shafts, it is said to be an upper deviation. In holes, it is said to be a lower deviation. The important terms in the limit system play a very crucial role in machine design. The type of fits and the basis system are the next important topics.